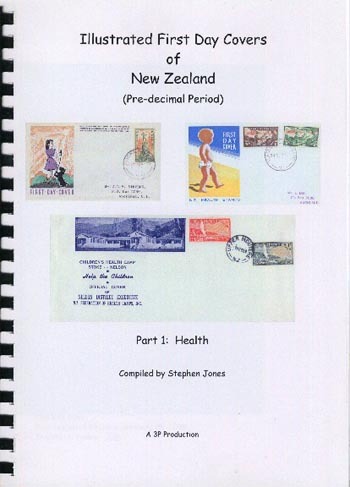 This is a catalogue detailing all the known Health First Day covers with illustrations or cachets that have been produced or available for first day use from 1933 to 1966. Combining the resources of three extensive collections of this material, the book contains over 400 illustrations with the vast majority using scans of the original covers. Only a few examples are known of some of the covers. It records details of all known colour variations and the sizes of envelopes used in their production. All available design varieties have been illustrated including examples of those with missing colours. The illustrations are at 60 to 65% of the original size allowing for all but the smallest detail to be viewed. Each cover and variety has been allocated a unique catalogue number, a scarcity rating and a catalogue value with over 570 different covers and varieties catalogued. Where known, there are details of who designed, printed or produced the covers. There is a section of related Health Camp opening, promotional sales, last day, and hand illustrated examples. The A4 sized book will be produced as a high quality scanned copy taken from a laser printed master, spiral bound with a protective clear plastic cover and card back cover. Over 150 pages, more than 400 B/W scanned illustrations and over 570 varieties catalogued. Colour cover and two colour pages, including one with a full size reproduction of the very rare 1933 Kiwi Exchange Club cover. Unique catalogue number and scarcity rating for every known cover and variety.